Features up to 60 channels. THE isoLynx SLX100 Isolated Data Acquisition system is an intelligent, high speed, modular, fully isolated distributed system that provides superior reliability, accuracy and isolation for a wide range of rugged high performance industrial applications. It is available from Scientific Devices . With its ability to interface with more than 650 SCM5B analogue I/O modules, the isoLynx SLX100 offers maximum flexibility for factory automation, process control, test and measurement, machine contro, and data acquisition applications. * RS232/485 and Ethernet interface. 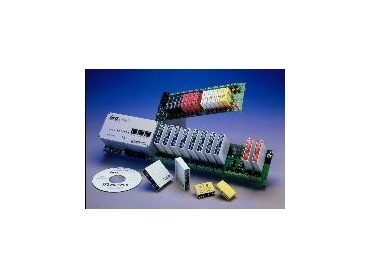 The system is comprised of a 12-channel base system including an I/O controller module and optional 8- or 16-channel expansion backplanes all of which can be panel or DIN rail mounted. One I/O controller module can operate up to 60 channels of differential analogue I/O and 128 channels of digital I/O, using Dataforth's versatile SCM5B analog modules and SCMD digital modules. The I/O controller contains a powerful high-speed microcontroller, A/D and D/A subsystem, communication interface, system memory and status LEDs. The highly modular design and ability of all wiring to remain connected to the system when accessing I/O modules, ensures excellent field serviceability and easy upgrades. By selecting from Dataforth's 650+ standard and custom single-channel SCM5B analogue I/O modules, the isoLynx SLX100 Isolated Data Acquisition system can interface to a broad spectrum of analogue signals, including millivolt, volt, milliamp, amp, thermocouple (linearised and non-linearised), RTD, potentiometer, slidewire, strain gage, AC-to-true RMS output, frequency, two-wire transmitter and transducers requiring dc excitation. Available analogue output modules provide a wide selection of current and voltage output ranges, while industry standard miniature digital I/O modules are used for digital ac/dc input and output requirements. The isoLynx SLX100 Isolated Data Acquisition system allows users to mix and match any I/O module type on a per-channel basis, thereby reducing wasted I/O channels and ensuring cost-effectiveness. The isoLynx API includes a suite of sample programs that can be customised to build powerful data acquisition and control applications in Visual C++ and Visual Basic. An OPC server provides OLE for Process Control (OPC) Windows server drivers, allowing isoLynx to communicate with a wide range of HMI/SCADA software packages residing on a host.